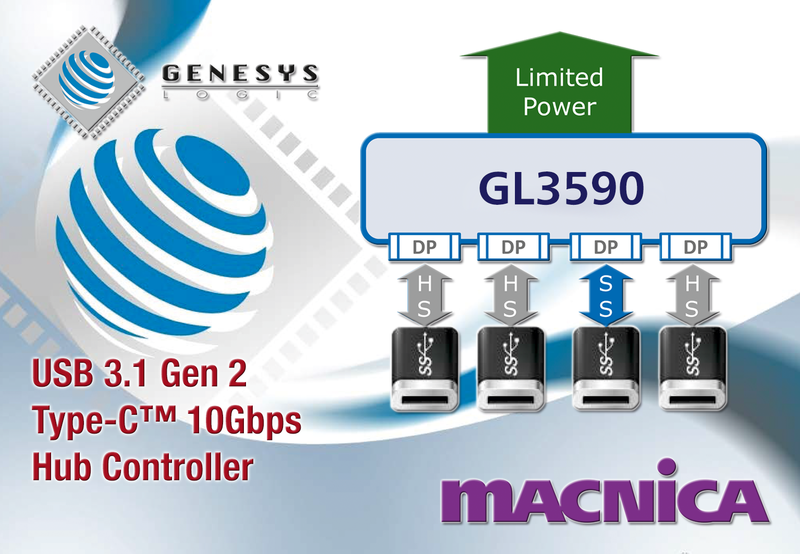 Genesys Logic, Inc., a leading IC design company in mixed-signal, high-speed I/O technologies, today announced its high-performance USB 3.1 Gen 2 USB-C™ integrated SuperSpeed Plus hub controller, GL3590. GL3590 USB 3.1 Hub controller features USB 3.1 Gen 2 PHY developed in-house by Genesys Logic with on-chip integration of USB Power Delivery (PD) and USB-C™ functions. By removing the needs of external MUX, USB PD and USB-C™ Configuration Channel (CC) controller, it not only eases the complex board design that would otherwise be required but also saves the BOM cost to help customers convert existing USB designs to support USB PD and USB-C™. In addition, GL3590 offers the best performance/cost and lowest power consumption on the USB 3.1 Gen 2 market. With extending and natively supporting USB PD and USB-C™ functions, GL3590 is well-suited in docking applications and retailed Hubs. In docking applications, GL3590 not only provides expansion for USB 3.1 Gen 2 ports but also features complete functions of USB-C™ CC, including reversible attaching, discovering/configuring VBUS, and configuring/providing VCONN power. GL3590 also provides built-in USB Billboard, USB-C™ bridge controller, and USB-C™ TCPCI interface. Besides, GL3590 integrates ADC to monitor current or voltage for port power consumption, and facilitates other controllers to manage power by accessing hub information through USB and I2C. It makes GL3590 to be ideal for power-demanding applications. To satisfy variety usages, and ease customers’ design, GL3590 integrates HID, and can be flexibly configured according to customers’ requirements, for example, disabling specific downstream ports, compound device setting, and customized GPIO/LED. GL3590 has built-in 5V to 3.3V and 5V to 1.2V regulators which saves both cost and area on the PCB board. In addition, GL3590 supports both individual and gang mode and is available in types of packages to fulfill different designs. Genesys Logic has been a leader in USB design and development with multiple USB device solutions on the market. What really distinguishes its products from the competitors’ is a robust USB PHY that not only reduces manufacturing cost but also shortens the development time it takes for the customers to get their systems to the market. Looking forward, Genesys Logic is developing other USB related controllers to provide the complete solution for customers. Genesys Logic specializes in the design, manufacturing, testing, and selling of ICs for PC peripherals and related products, and provides comprehensive solutions for consumer electronics and systems manufacturers. Our core competency lies in the development and application of high-speed SerDes technology. In addition to USB 3.1 Gen 1 technology, we have put a lot of effort into researching and developing high-speed SerDes interface technology to keep up with the trend of the new cross-disciplines and cross-platform technologies, and grasp the opportunities in the application markets. To maintain a competitive advantage in our products and help our customers gain more product advantages, Genesys Logic is continuously introducing more advanced process technology and implementing copper process in our main products. www.genesyslogic.com.